Inline skating and quad roller skating in the Greater San Francisco Bay Area, including places to skate, weekly group skates, and Northern California skating organizations. Skating locations, clubs, and resources. Full-size ice skating rink offering figure skating, hockey, ice dance, recreational skating, and ice skating school. Includes hours and pricing information. Inline and quad roller skating sites organized by topic, region, and type of skating. Roller skating rink in East Stroudsburg Pennsylvania with hockey and recreational skating programs. 'Dedicated to providing leadership, education, and services to the ice skating industry.' Focuses on ice skating as a recreational sport. Skating photos from many events in all disciplines, eligible and pro, and a selection of skating-related games. Offers figure skating, hockey, recreational skating, and skating school on a full-size NHL type rink. Located in CA. Newcastle, Australia arena offers ice hockey, figure skating, disco nights, and recreational skating programs. Fitness and speed skating club with local trail guide, photos and membership information. Information about Seattle-area skating, especially inline speed skating and Pattisons Team Extreme skating club. Schedules, events, and meet photos. Photos, video clips, and related links about inline skating and quad roller skating in Seaford, Logn Island, New York. Figure skating page with general information for the Massachusetts/New Hampshire area. Offers ice skating postcards, graphics, and java games. Features links to many skating sites, the latest results from competitions, and the latest news in the skating world. Offers articles and tutorials, a buying guide and a 'how to' section with technique tutorials and skate maintenance instructions. Detailed information on where to skate, clubs and leagues, skate shops, safety, and the law. Iceoplex Ice Arenas and entertainment complexes feature recreational public skating, hockey leagues, figure skating, and professional skating schools for all ages and ability levels. Roller skating birthday parties, juvenile inline hockey and the in-school roller skating 'Kids on Wheels' program. Special events such as Band Wars. Skating school owned by IISA certified instructor Stephen Fisher of Toronto, Ontario. Includes class descriptions, skate rental information, skating articles, and photos of skates and skaters. Inline skating instructor Curt Jablin provides all levels of academic institutions with equipment, lesson plans, and advice for starting school-based inline skating physical fitness programs. A skating skills program based on skill and technique development as a foundation for playing ice hockey. Hockey skating taught by hockey players. If the business hours of Places to Skate Database in may vary on holidays like Valentine’s Day, Washington’s Birthday, St. Patrick’s Day, Easter, Easter eve and Mother’s day. We display standard opening hours and price ranges in our profile site. 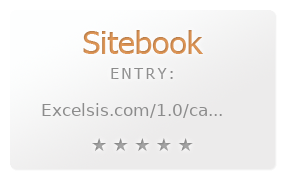 We recommend to check out excelsis.com/1.0/catalog.php?categoryid=5 for further information. You can also search for Alternatives for excelsis.com/1.0/catalog.php?categoryid=5 on our Review Site Sitebook.org All trademarks are the property of their respective owners. If we should delete this entry, please send us a short E-Mail.